Enhanced default character set management for new databases. 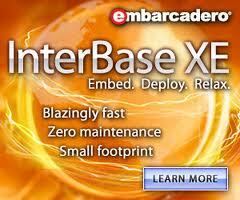 Larger transaction ID support enabling databases to run even longer between back-up and restore. Developer managed inbuilt tracking of modified data for the purposes of modern replication / synchronization requirements. Updated demo SVN using new database technologies in RAD Studio. Esta disponível o update 5 do Interbase XE.